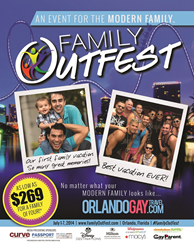 Converge Orlando Inc., the LGBT Convention and Visitors Bureau for Central Florida, just announced the launch of its very first annual Event for the Modern Family: Family Outfest. The event is set to take place from July 1st to July 7th and sponsors include Walt Disney World Resort, Macy’s, Hilton (Orlando Lake Buena Vista), and Nickelodeon Suites Resorts. Passport Magazine, Connextions Travel Magazine and Curve Magazine as the media presenting sponsors. The first of its kind, it is designed to bring LGBT and Straight Allied families together to experience the city's beautiful, theme parks and other family friendly activities found in Central Florida. At Converge Orlando, we call this an event for the modern family, where ALL families of all backgrounds and all walks of life are welcome. “Our organization has been working hard at not only promoting Orlando as an LGBT friendly destination but also at making sure we create events that bring opportunities for the community, its businesses and its members. Family Outfest is one of the many we have in the pipeline and we are extremely excited to be bringing this inaugural event to Central Florida,” said Mikael Frank Audebert, Executive Director of Converge Orlando. Disney’s Yacht & Beach Club Resort will be the host hotel while two additional properties (The Hilton Orlando Lake Buena Vista and the Nickelodeon Suites Resort) will serve as official hotels to welcome hundreds of families from around the World. Official events will bring local communities and travelers together. These will include a Welcome Reception, a Parents Night Out, Nick After Dark, The Fun Spot, daily theme park activities and an Independence Day Festival at Gaston Edwards Park on July 5th closing with a fireworks show over Lake Ivanhoe. Converge Orlando was created 3 years ago to solely concentrate on enhancing the LGBT-friendly perception of Orlando and Central Florida and improve the visibility of the destination to gay and lesbian visitors. Orlando is fortunate to be in the top 10 most popular travel destinations for LGBT travelers. There are many opportunities to put us on at least parity to other competitor US destinations in the outreach to this market. The short-term goal of Converge is to increase LGBT expenditures here by at least 25 percent. Converge Orlando is a non-profit membership organization that receives no tourist tax or public funds.